Today, I want to talk to you about building your MLM Business from the bottom up. This is such a simple, yet life changing concept that I learned from one of my mentors, Don Failla. I only wish I would have learned about this concept when I first joined the industry back in 2002. Most people who join our industry are taught to recruit, recruit, recruit. In other words, recruit as many people as you can, as quickly as you can, and place them on your front line, in order to find a few people who are serious about the business. Throw a bunch of mud against the wall and see what sticks. 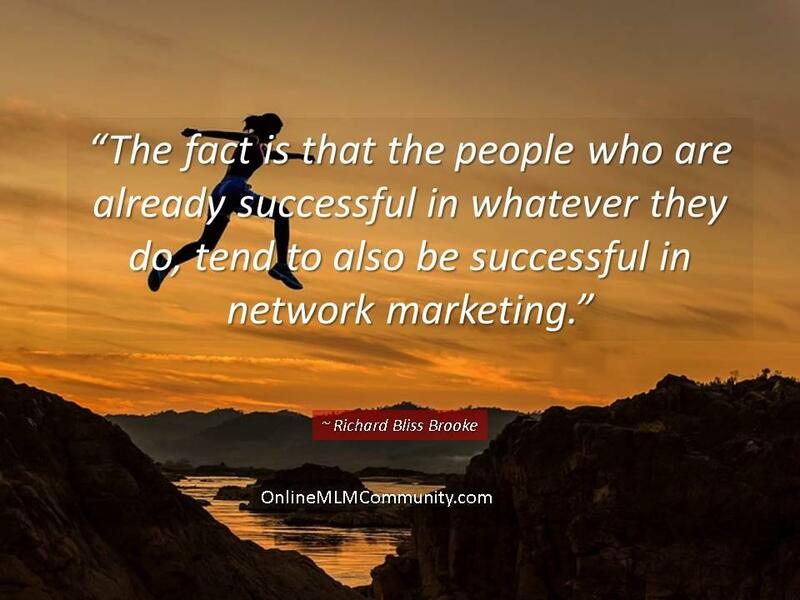 While this strategy is better than doing nothing at all, and it does work, I don’t see it as the most efficient or effective way to build a successful network marketing business (just my opinion). The major downside is that if you recruit a lot of people quickly, you won’t have much time to work with each person, and attrition will be very high. To be quite honest with you, I think there is a much better way to build your network marketing business. The best way to build your network marketing business is from the bottom up, not from the top down. In other words, spend more time working in depth than you do on personal recruiting. Spend more time helping your team members recruit. Yes, you will need to personally recruit some distributors during your first few months (up to your first two years) in the business until you find several people who are coachable, hungry and willing to work. Once you have 3-5 SERIOUS people who want to build it big, and want your help, it makes more sense to help them recruit than to keep sponsoring people yourself. 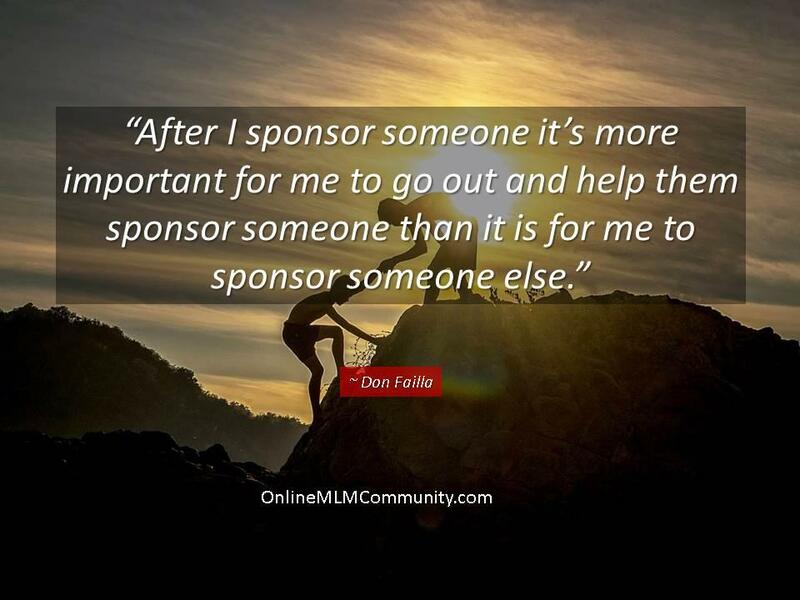 Once you get someone sponsored who wants to pursue the business, your goal is to help them sponsor a few people and get a few customers as quickly as possible, preferably in their first month or two. Once you help them do that, you immediately shift your efforts and start working with their new people. You don’t abandon the person you sponsored, but you now spend more time helping their team grow, so they can go out and recruit more people on their front-line. For example, you sponsor Judy. Judy is excited about the business and she sponsors Tim, Frank and Mike. Of those three only Tim is interested in building a business, so you help Tim sponsor Alice, Joe and Kate. Kate is excited about the business and you help her sponsor David, Lance and Destiny. Lance is fired up so you help him get his first few people sponsored. By working with Lance, you have now motivated and excited Judy, Tim and Kate. They will be excited about the growth of their team. This will give them the added motivation to get to work and keep building, because they have something to lose! Remember, fear of loss is the best motivator. You simply keep repeating this process over and over at the bottom most point of each leg in your organization and never stop until the leg is at least 100 levels deep, if not even deeper. Some people might think this is crazy, but I see a several major benefits. The first major benefit of building your MLM Business from the bottom up is that you can work smart. It’s much easier to help other people recruit than focus all of your time finding new prospects to recruit. If you’re working with five people and each person has 100 prospects, that is 500 potential prospects for you to work with. Another advantage of building your MLM Business from the bottom up is that you will find typically find your best leaders in depth. In most cases, the people you personally sponsor won’t be your best leaders. Sure, some might, but it is highly unlikely. Normally, your best leaders show up on level 4, 5, 6 or even deeper. By driving each leg of your organization at least 10-20 levels deep, the odds are in your favor that a leader will show up somewhere. And when the leader shows up, you won’t have to work as hard in that leg because they will run with it on their own! The third advantage is the roll up. In most compensation plans if the people between you and the leader in depth don’t do anything, or if they quit, the leader’s volume rolls up to you anyway, so it is a win-win proposition. And for your team members to get paid on their depth, they will have to meet certain volume requirements, so this helps you as well. Now, I can’t speak for you, but I would much rather find my leaders on level 50 than on my first level. Yes, I would make more initially by having a leader on my first level, but having a leader that deep in your organization helps motivate everyone in the pay leg above them. That is what you want to happen. Even if just three, four or five people above the leader in that leg get excited because of the leader in depth, your volume will skyrocket! I learned this valuable lesson from Dale Calvert. Thanks, Dale! From this day forward I encourage you to build your MLM Business from the bottom up. Build taproot legs and drive each leg as deep as you can, as quickly as you can, until you find several good leaders in each leg. Always work with the newest, most excited person at the deepest level in each leg. Do that and your team will stay motivated, grow faster, your volume will go up significantly, and you will build rock solid legs that you don’t need to babysit or keep rebuilding. What are your thoughts about building your MLM Business from the bottom up? Leave a comment below and let me know what you think. I look forward to hearing from you. Building from the bottom is the only way to have a sustainable income. I often ask local people to share their list so we can see if we have any friends in common. I then work with the newest person to contact those people first. It works really well for our team! Always work at the bottom most point of your organization and work with the new blood. This absolutely makes sense! I have seen so many times people focus on who they bring in and not the people in the bottom levels. The best leaders do exactly what you have laid out. They know it is a better idea to engage with as many people in all the levels. Great post, Chuck! When you work at the bottom most point of your group you motivate everyone above them. Building from the bottom up makes so much sense. It’s about doing what is going to be the most productive and efficient. This way you are able to start letting your first tier of people start putting in some of the work for you, rather than bearing the burden of all the responsibility on your own. I’m not sure people are properly informed about this even being an option. So once again, it’s great that you put this kind of information out there. When you light a fire in the basement, everyone above them gets excited. This makes so much sense that I am surprised that more network marketers have not utilized this system. What really makes the most sense is the fear of loss. If a person has someone working the business underneath them, quitting becomes something not considered because of the loss involved in doing so. Hopefully many network marketers read and heed this great blog post. By building depth, you are keeping people in, and stopping a rotating door. People will still quit. Some people will still do nothing. But this definitely helps build growth and excitement in a team.